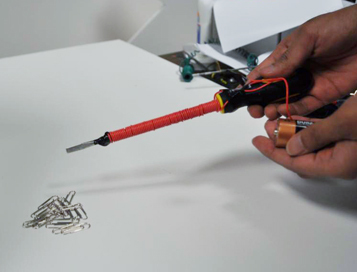 Electromagnets are temporary magnets that can be turned on and off. 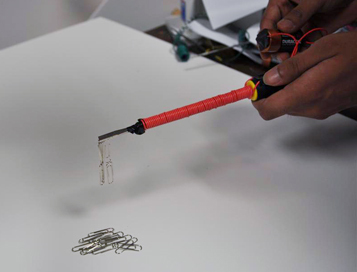 They can be created from ordinary magnetic objects such as an iron nail or an iron screwdriver. 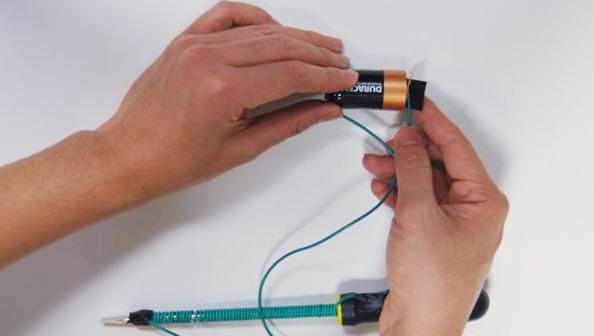 Follow these steps to make your own electromagnet and learn how it works. 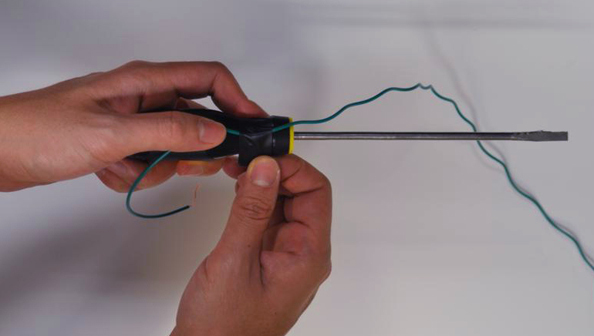 Put the tip of the screwdriver near a few paper clips and it should pick them up like a magnet! Warning: The battery and the coil may become warm since the battery’s power is consumed somewhat quickly. 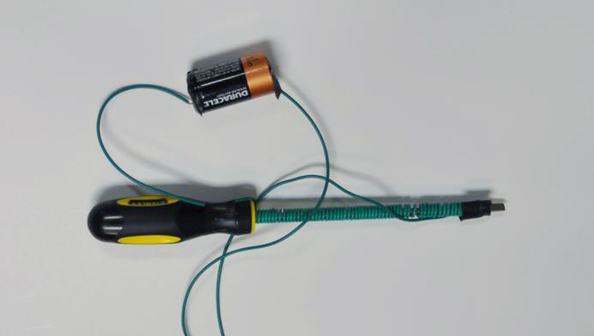 When you detach the batteries from the coil, the screwdriver no longer behaves like a magnet. 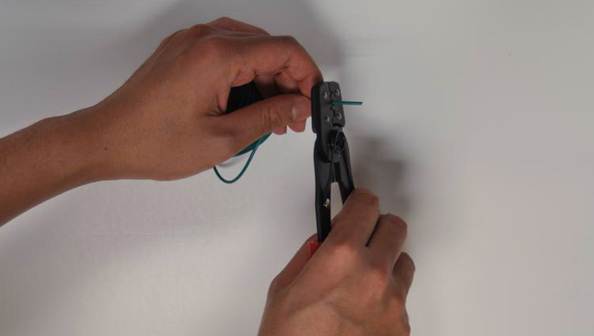 The paper clips will fall from the tip of the screwdriver. Warning: To help save battery power, keep the wires disconnected while you are not exploring. 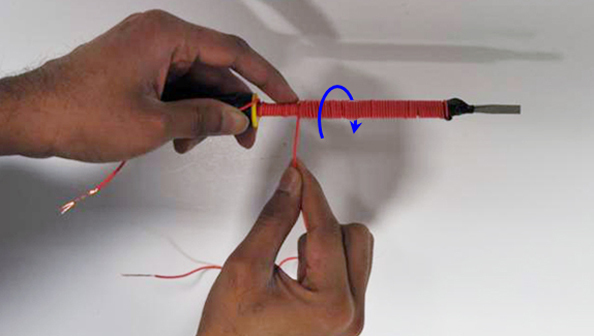 When two ends of a wire are connected to a battery, electrons stored in the battery start flowing through the wire. The flowing electrons (also known as electric current) behave like tiny magnets and produce a magnetic field around the coil. 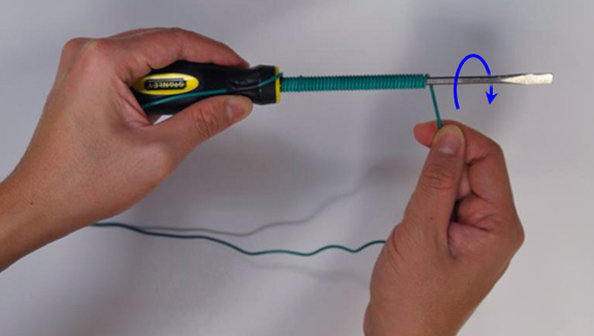 The figure shows a copper coil that is conducting electric current and the magnetic field (shown in blue) produced by it. Observe that the magnetic field is strongest inside the coil. Moreover, the greater the current, the stronger the magnetic field. 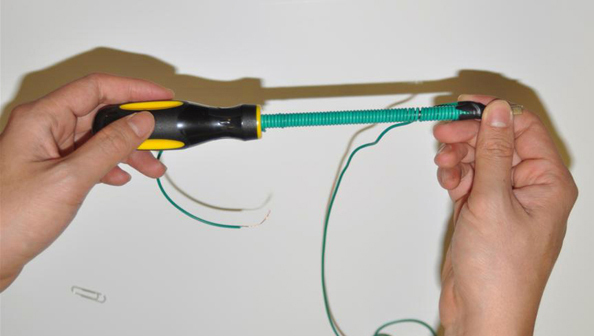 A screwdriver placed inside the coil will be magnetized by the magnetic field in and around the coil. One can now use the screwdriver as a temporary magnet. 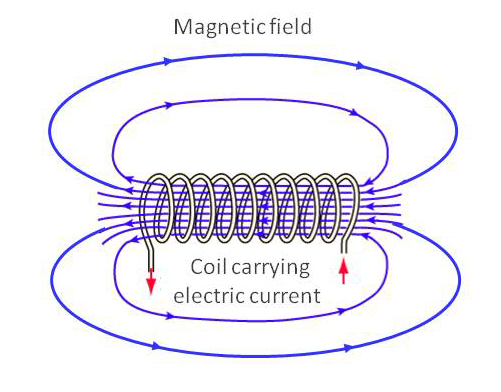 However, it will only be magnetized when electrons are flowing through the coil, since it is the electric current that creates the magnetic field. This is why the screwdriver electromagnet "turns off" when we detach the battery from the coil. Did you know that the connection between electricity and magnetism was discovered by accident? In 1820 Hans Christian Ørsted, a Danish physicist, was conducting some electrical experiments when he accidentally placed a compass near a wire carrying electric current. The needle of a compass suddenly deflected from magnetic north. The compass returned back to point north when the current through the wire was cut. 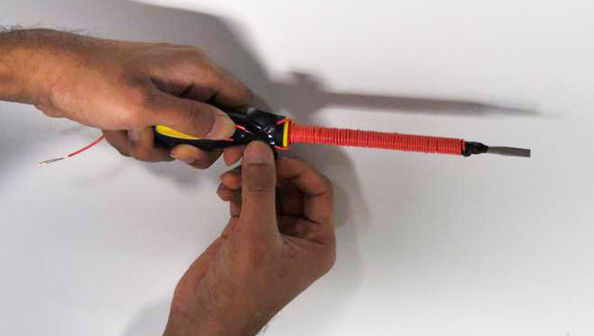 This deflection convinced him that magnetic fields radiate from all sides of a wire carrying an electric current. Explorers have been using compasses to navigate the Earth for centuries. But do you know why a compass points North? The reason is because Earth is a giant magnet. In addition to helping navigators, the magnetic field produced by the Earth also protects us from harmful electrically charged particles blown away by the sun. While it is still unclear as to why the Earth produces a magnetic field, scientists believe that it may be due to the circulating electric currents in the planet's molten metallic outer core. 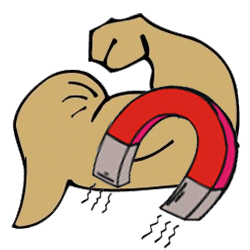 The world's strongest electromagnet, called the 45T Hybrid Magnet, is housed at the National High Magnetic Field Laboratory in Florida, US. It weighs 35 tonnes, has 4 miles (6.4 kilometers) of superconducting wires and is operated at a temperature of -456°F (-271.1°C). It is over 4,500 times stronger than a strong refrigerator magnet and over half a million times stronger than the Earth’s magnetic field. Super magnets like the 45T help scientists with research that leads to advancements in medicine, material research and understanding nature. "Electromagnetism." Wikipedia, The Free Encyclopedia. [Online]. Available: http://en.wikipedia.org/wiki/Electromagnetism. [Accessed: Jan 20, 2013].